Phone the RAC on their breakdown cover contact number 0330 159 0740 for general enquiries about your membership, for example should you need to renew your membership or upgrade your policy then you should phone their friendly customer care staff. You should also phone this number to update your account details in the event that you have changed your name or moved house. Similarly if you are having technical difficulties when using their online self service platform or you have forgotten your login details then you can dial this number for troubleshooting advice. If your RAC membership card has been lost or stolen you should report it to them as quickly as possible in order to get a replacement sent out to you. Lines are open 8am-8pm Monday-Friday and 9am-5pm Saturday-Sunday as well as UK bank holidays, however closures may be in effect on Christmas Day and Easter Sunday. Calls to the RAC breakdown cover helpline 0330 159 0740 are charged at the same rate as phoning local 01 and 02 area code phone numbers, thus you will be charged an access charge as well as a variable per-minute rate. However you can contact RAC for free on this number provided you have free inclusive minutes as part of your landline or mobile tariff as these can be used to call 03 UK phone numbers. Contact the RAC if your car has broken down by calling their dedicated 24 hour phone number 0333 2000 999 to receive roadside assistance. If they are unable to fix your vehicle they will provide you with a lift to your desired location, plus they will tow your stricken car to a safe location. You should also call this number if you have been involved in an accident so that they can assist in removing your vehicle safely. Lines are open 24 hours a day, seven days a week therefore you can call them at any time in the event you have broken down. Phone the RAC on their car insurance contact number 0330 159 1031 for customer service advice about your vehicle policy, where you can also upgrade it by adding optional extras such as breakdown cover and windscreen protection. You should also call this number to notify them that you have sold your car or purchased a new car to transfer to a new policy however you may have to pay a fee for early cancellations. You can also call this helpline to determine whether your classic motor vehicle can be covered by one of their specialised policies. Alternatively if you would like to make a claim on your policy in the event you are involved in an accident or technical failure then please consult the table below to find the relevant contact number for your enquiry. Phone RAC for free by calling their freephone contact number 0800 308 1111 for general enquiries about their caravan and motorhome insurance policies. You should call this helpline if you would like to get a quote for your mobile home cover, where you can also upgrade existing policies by adding cover for more locations. Furthermore if you are changing the vehicle which you regularly use to tow your caravan or you are changing to a static holiday home you should inform them to update your policy details. In the unfortunate event where you need to make a claim on your motorhome insurance policy you should instead call their claims phone number 0333 323 0966 which is charged at standard UK local rates. Contact the RAC on their UK telephone number 0330 159 1156 to get a quote for their motorbike insurance policies, where you can add protection for your leathers and your helmet to your existing cover. You may be able to add another motorcycle to your policy by calling this helpline, where you will also be able to enquire whether your classic bike can be insured under their cover. You should also call this number if you are involved in a collision or personal injury whilst on your motorbike as you will be able to file a claim on your policy. Lines are open 9am-7pm Monday-Friday and 9am-4pm Saturday so please be aware that you will not be able to contact the motorbike insurance customer care team on Sundays and UK bank holidays. Call the RAC on their telephone contact number 0330 332 8308 for general enquiries about their range of van insurance policies, thus you should call this number to get a quote for cover on your commercial vehicle. Moreover they may be able to offer special rates for certain industries such as couriers, trade professionals and entertainment haulage therefore you should call them to ascertain whether you are eligible for these policies. Please note that if you would like to make a claim on your van insurance policy you should call their emergency helpline number 0330 332 8315 which is open 24 hours a day, seven days a week. Phone their RAC by calling their UK home insurance contact number 0330 159 0985 to discuss your house and contents cover, where you will be able to add valuable possessions to your existing policy. However please note that your monthly premiums will increase according to the value of items you add to your cover. If you are moving home you must inform them immediately to either transfer your cover to your new address or to cancel your policy, although you will have to pay a cancellation charge if you end your contract early. Finally if you would like to make a claim after your house has been beset by an emergency such as fire or flooding please call this helpline where their specially trained team of advisors will sensitively guide you through the rest of the process. Contact the RAC to take out a travel insurance policy by calling their UK phone number 0330 159 0409 which applies to single-trip and multi-trip holidays. Furthermore if you would like to renew your policy from a previous excursion you can dial this number to get an updated price quote. If you require emergency medical assistance or if you need to make a claim on a hotel cancellation you should dial the appropriate number from the useful list below, where you will also find relevant contact details if you have lost your mobile phone whilst abroad. Contact the RAC on their legal care helpline number 0330 159 0442 to phone an advisor who will provide you with assistance if you are dealing with a non-fault dispute over a motor accident. This is effectively their legal insurance policy which covers your court expenses as well as consumer disputes over the mis-selling of vehicles, therefore if you have been sold a faulty car you can call this phone number to make a claim against the seller. Moreover if you are a member of the RAC you can call them for free legal advice on a range of private matters including wills, probate, employment disputes and divorce issues by calling their dedicated contact number 0330 159 1446. Contact the RAC if you are planning on buying a second-hand car by calling their vehicle inspection phone number 0330 159 0324 to get a quote for one of their specialist engineers to examine the motor. If you use this service they will send you a report detailing any faults on the vehicle, the structural integrity of the chassis and brake fluid analysis to ensure that it will be safe to drive. Alternatively if you would like an RAC automated car check against the registration number of the car you are interested in purchasing then you should call 0330 159 0364, where you can establish whether the vehicle has previously been written off, stolen or scrapped. Contact the RAC shop on their UK phone number 0115 841 4016 to purchase car parts over the telephone. Further items included in their extensive catalogue are radio systems, satellite navigation devices and car seats for infants. Another reason for calling this number is to request a refund for faulty parts, plus you will be able to claim for compensation if these have damaged your car’s engine. Alternatively if you would like to buy a replacement battery for your vehicle please call their dedicated freephone number 0800 096 2968 which is free of charge from all landline and mobile telephones. Phone the RAC on their dedicated UK contact number 0330 159 0784 for business enquiries regarding breakdown cover, vehicle leasing and tracking using their state of the art telematics systems. Moreover if you would like to take out business insurance for your premises you can call this helpline to receive a quote for your protection. Alternatively if you are an existing business customer you can query a bill payment or renew your contract by phoning the appropriate phone number from the table below. 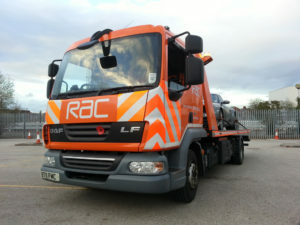 Phone the RAC head office in Walsall directly by calling their switchboard contact number 01922 437 000 to make a complaint about a delayed breakdown callout, a faulty part they have fitted to your vehicle or the conduct of one of their mechanics. Furthermore you can call this helpline to complain about an insurance claim if you believe that you have been underpaid or unfairly denied compensation. Alternatively if you would prefer to send your feedback to the RAC in writing please use their UK postal address provided below, however please note that this will take longer than calling their telephone number. As well as offering a comprehensive range of telephone helplines you can also contact the RAC in writing by use of their email and postal addresses, you can even send messages to their customer service staff via their profiles on social media websites. If you would like to write to the RAC you may use their customer service postal address below, where you can enquire about your membership, an insurance policy or a vehicle inspection that they have performed on your behalf. To email the RAC please fill out an online contact form on their UK website, where you can request a reply by return email or by a callback at a convenient time for you, you can also select which RAC department you would like to get in touch with by selecting from the menu on the left hand side of the page. Many organisations such as the RAC use social media websites to promote their services and sales, some even take the synergistic relationship further in allowing you to message their customer service staff through their company profiles.